The Wild Inside: Ain't we got fun?!?! Well, it's been an interesting coupla days! Lots going on! I whipped off the pearl bracelets for three individual donation baskets my artisan guild is putting together (and which I need to deliver at one of our all-day meetings on Saturday). The idea was for each of us to have a consistent value for the items we include in our group's charitable donation baskets so we can always use the same value statement about the basket as a whole. Keeps things simple. 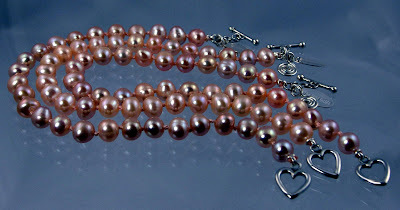 I didn't mean to get so carried away; but I love working with pearls and I love to knot. So I just dove in and did it without really thinking about what the end value might be. As it happens, these three work out to $58 each .. they're Grade A fresh water pearls (a pale peach color, in case your monitor turns 'em pink) hand knotted on pale peach silk cord (incredibly sensuous stuff!!) with a delicate hand crafted (as opposed to cast) Bali heart toggle and a little spiral charm I made (if you click on the pic, you can get a closer look). And, of course, I had to make up little individual paper tags with the name of the piece (it's Blossom), a brief description of the materials - and a condensed version of my blurb on the "care and feeding" of pearls .. not to mention my logo and all my contact information. I had initially planned on something in the $28 to $35 range, but I'm pleased with my choice. Since the donations are all for a good cause, the little heart toggle seemed perfect. But I'm not married to the design .. I can always create something else for the next round of baskets! 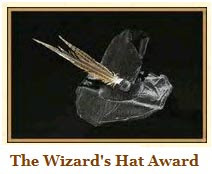 And THEN, I get online this morning to discover I've been awarded The Wizard's Hat Award!! How cool is that?!?! Wizard is an exceptional local photographer with the heart n soul of a true Earth Mother. Besides having an incredible eye (a Wizened Eye!) for things you and I would pass unnoticed, she's connected to the earth. I think it's probably this connection that allows her to see those things the rest of us don't. Anyway, we've been corresponding a bit and getting to know one another. So I've made revelations .. you know, the kind of revelations you make when you open up to a new heart. 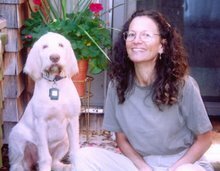 And in an independent twist of the ubiquitous blog award, Wizard has created one of her own .. for, in her own words, "artists recognizing artistry" .. and awarded it to five of us. I feel like I've just received an Academy Award or something! It's a trifle, yes .. but it's so much more satisfying to receive praise and recognition from a fellow artist .. someone who understands the grasping, frustrating, exhilarating, tryin' something new, fun of the creative process. However, the pressure is now on - to keep the flow of "ideas and creative energy" ... flowing! And with great timing, and in keeping with that theme, I tried a whole new process yesterday!! I was so excited when I completed the thing, I tried to call my friend, Andrea, in Albany - who was both wonderfully open and forthcoming with tips and tricks for making it work and instrumental in helping me believe I could do it. Now that I've done it .. and another in a copper craft wire .. I'm ready for sterling, I think. 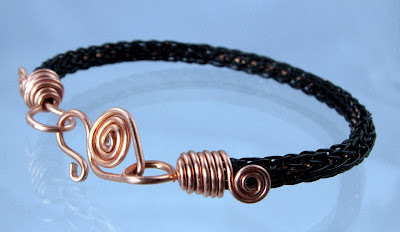 I may make one more in the copper craft wire, as adding a new wire while weaving has posed a couple bumpy problems. I got such a rhythm going though, that the work moved along at a nice little clip .. it's kinda meditative in a way. The process is called Viking Weave .. and it requires a LOT of wire. The first one I made (above) uses coated copper craft wire. I didn't read through the directions completely and carried on after an initial "starter weave" using just a single weave process, so it didn't use as much wire and was a bit more loose and open than the uncoated copper craft wire version I did next using a double weave. Tried to keep track, but I think it was something like 15' of wire on the second one. It just seemed amazing to me that I was weaving wire like this; but a truly incredible transformation takes place when you draw the completed weave through a wooden drawplate: it condenses down and becomes a tight little design. A drawplate includes a series of holes in progressive sizes. With this design you squish the leading starter weave so you can polk it through the largest hole, grab it on the other side with drawplate tongs, and pull it through. It's like magic, what comes out on the other side!! I pulled it through two additional smaller holes to end up with the tight weave you see here. This one has a core wire of copper running through for support (you can just barely see the copper through the black wire); and because I have no copper findings, I had to create my own copper end caps and clasp. When I knew I was going to be trying this design, I placed an order for some sterling end caps. They haven't yet arrived, but they'll provide great motivation to complete a sterling version once they get here! I can barely contain myself, I'm so excited to complete a sterling weave .. though I'm now thinkin' five sets of end caps aren't going to be nearly enough!! Fibula: An ancient and often ornamented clasp or brooch used in ancient Greece and Rome to fasten clothing. It usually consists of a piece of bowed metal with a pin connected to one end with a hinge. The pin is pushed through the clothing to hold it together and is secured into the other end of the bow behind a catch plate. A fibula is sometimes referred to as a ‘safety-pin brooch’. Wow!!!! I'm so impressed and excited for you Karan! Thank you for your kind words. My own artistry had been too long on the shelf... It is pure joy to become acquainted with you, and I look forward to your May class, both for the fun of learning to string/knot a pearl piece and for sharing a few hours with you in person!